Historically speaking, the level of horse care has never been better than it is right now, but as our horses routinely live into their late 20s and early 30s, meeting their nutritional needs can become a challenge. 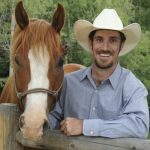 With that in mind, here are some helpful tips on how to keep your horse in the proper body condition as they get older. The most important things to remember aren’t that different from any horse – feed a good quality source of hay, keep dust and mold to a minimum, and provide plenty of clean water. Don’t forget to use a water heater as the wintertime temperatures of unheated water typically cause decreased water consumption in older horses, which can lead to colic. Consider feeding your older horse separate from some or all of the younger horses, especially if they are not competing well in a group feeding situation. You want to ensure that your horse is getting all of the calories that you intend them to (or NOT getting any extra calories if they are an easy keeper!). Multiple feedings each day (3 or more times/day) are preferable for any horse, but multiple feedings are even more important for older horses in helping with calorie absorption and avoiding colic. Make sure that you regularly get your hands on your older horse. Groom them at LEAST weekly to keep their skin and coat healthy and take that time to assess their body condition score (a system developed to assess how fat or thin they are, based on a scale of 1-9, which can be found at http://www.uky.edu/Ag/AnimalSciences/pubs/asc145.pdf ). We also highly recommend that you obtain a weight tape, learn how to use it, and incorporate it into your monthly equine care routine. Regular dental checkups, at least once per year, are extremely important to help keep old horse teeth in as good a condition as possible. Good teeth are a vital part of calorie absorption. Properly floating on a regular schedule can correct small issues before they become big problems, and help older horses keep their teeth for longer. Teeth that aren’t checked regularly, and floated when necessary, can lead to earlier tooth loss, an inability to chew forage, choke, and even colic. If you find that your horse IS losing weight, or having trouble keeping their body condition up, make sure to schedule a visit with your vet to discuss this issue. It could be something as simple as your horses’ ability to absorb calories has changed. If this is the case, adding a specifically formulated Senior feed like Purina Equine Senior could greatly help your horse to keep their condition up with some easy to absorb calories. Any change in attitude, appetite or weight could be a sign of a problem in older horses. Catching changes early on can help you, and your vet, to take the correct steps to treat any potential issues. 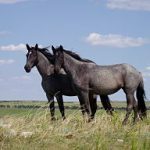 With the proper care, your older horse can enjoy life to the fullest for a long time, and you can enjoy the company of your geriatric equine partner, and friend.